The new generation of compact fan technology is on the market. Multiframe® fans have completely unique multi-piece chassis, which eliminates vibration already inside of the fan. Therefore resonance throughout the system is reduced. Additional measures for noise reduction such as the use of decoupling kits or insulation mats can be spared with these fans. Depending on the case used, Multiframe® fans are able to reduce the fan-induced noise below the noise from the airflow itself. Multiframe® fans are than ''more silent than the air''. The new Multiframe® technology has a array of new features: The integrated vibration absorbers are just one of the new features that all contribute to noise reduction. For example the vibration absorbers are wider than the chassis to avoid any contact between case and vibrating parts. The use of massive and heavy materials in the fan leads to a lowering of the noise's frequencies, therefore making it less audible and more comfortable to the human ear. Aerodynamic optimization of frame and strutting also reduce noise by air swirling. This reduces a majority of the noise through airflow and therefore a large part of the overall noise level of the fan. The other parts of the Multiframe® fan series are also on the highest technological level. The improved EKAplus motor is voltage-independent extremely quiet and has an especially low starting voltage. The bearing used is the new NB-NanoSLI® bearing, which is especially quiet and has a long lifespan thanks to a special lubrication system. The fan is also equipped with a reliable auto-restart mechanism and is protected against polarity reversal. Interesting is the fact that the noise level of the Multiframe® series is almost completely dependent from the case they are installed in, as noise produced directly by the is reduced to a minimum and usually below the noise level of the airflow. Thereby these fans are more quiet than their airflow. With this new generation and advance in noise reduction more and more responsibility for noise reduction is in the hands f the case manufacturers. 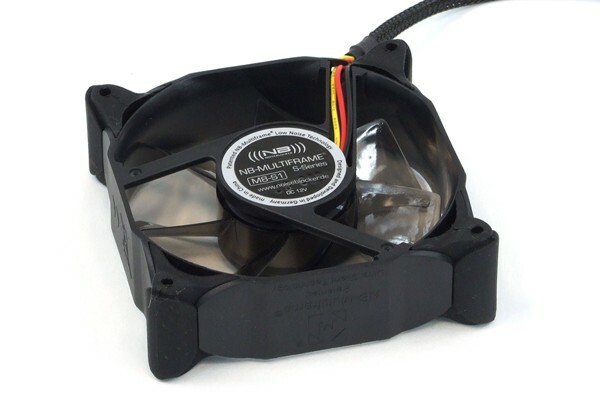 If full advantage is to be taken of these fans an aerodynamically optimized case has to be used, which does not obstruct airflow with tight meshes or other obstructions.